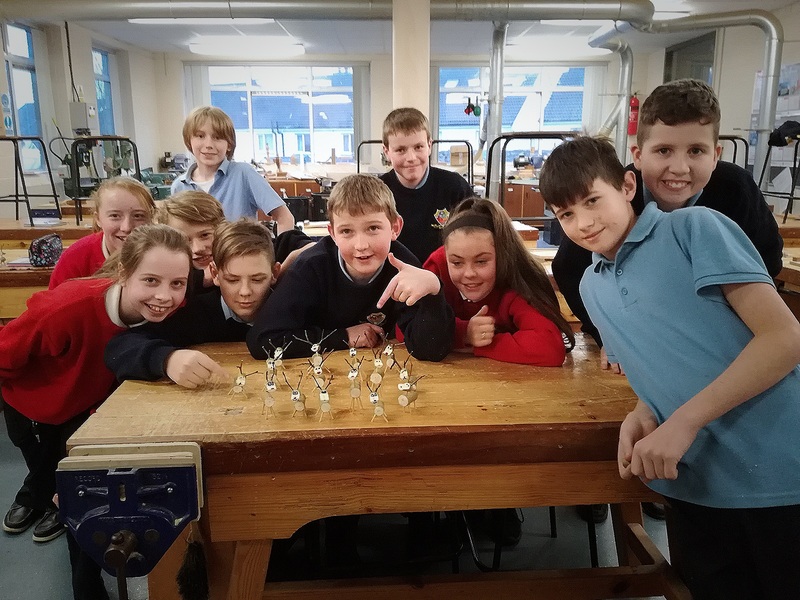 Well done to our First years who took part in our 1st Mannequin Challenge. Video is available on our Facebook page here. 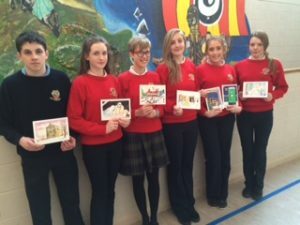 Did you see the beautiful hand painted Christmas cards created by our students? Perhaps you surprised a loved on abroad. Or framed the pack and displayed them in your house this Christmas. Each card was unique and shows great artistic skills. 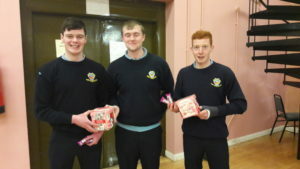 Contact school office if you would like a to buy a pack for a keep sake. 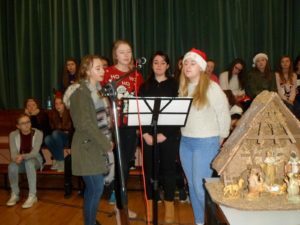 A huge thank you to Ms Kavanagh and Ms Fallon for organising this hugely successful project. 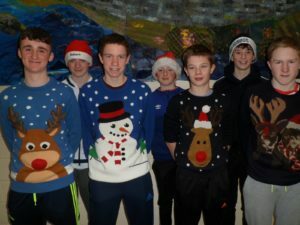 Look out in shop windows all over Dunmore for Transition Year window painting this Christmas. Well done to all. A huge thank you to Ms Kavanagh for giving us the skills to be so creative. 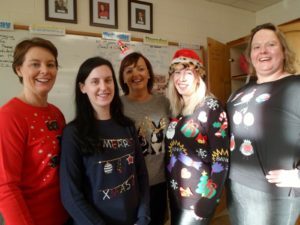 Great festive fun! 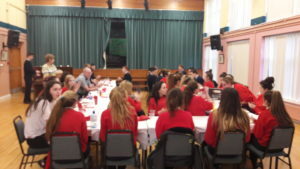 Our Leaving Certs enjoying a Christmas dinner. 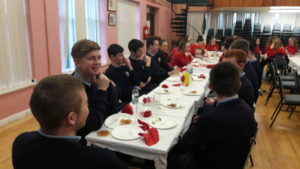 A special word of Thanks to Ms McManus & the TY students for all the hard work. 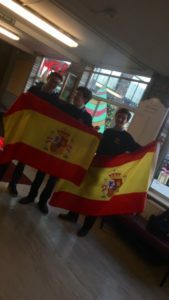 We wish our Spanish students the best of luck as they travel home for Christmas. 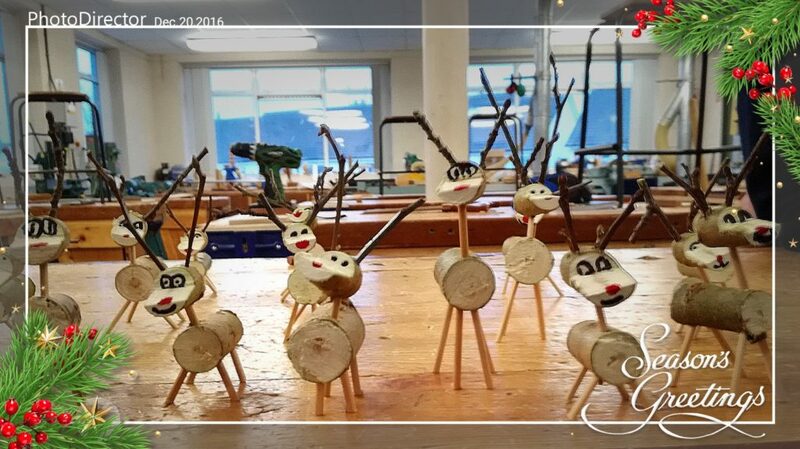 Well done to some of our first year students who made little reindeer in Woodwork class today. Santa knows where to come if he needs to get a new Rudolf this year. 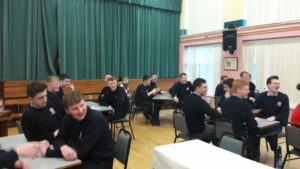 Public Speaking Workshops for Transition Year Students with Alan Devine. Through his innovative ‘Drama Club’, the well-known face of Irish TV and film Alan Devine will be back again to the school on an invitation to introduce the students to the skills of public speaking. 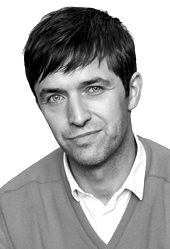 He teaches students on how to find confidence in their own voices, how to connect with an audience and the secrets of delivering their message with clarity. 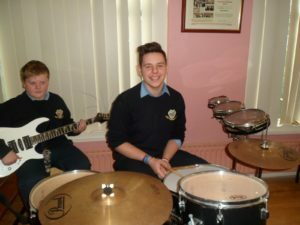 His workshops are very educational and enjoyable and have always been very popular with our students. 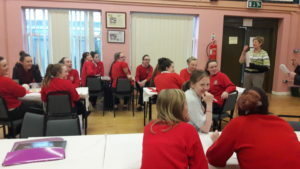 The series of drama-based public speaking workshops for secondary school students focus on how to make eye contact, connect with an audience and how to structure and deliver a speech. 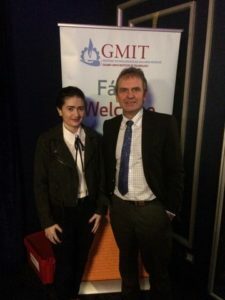 This experience will prove invaluable to students in later life in whatever career they choose and gives them confidence in many aspects of school life. 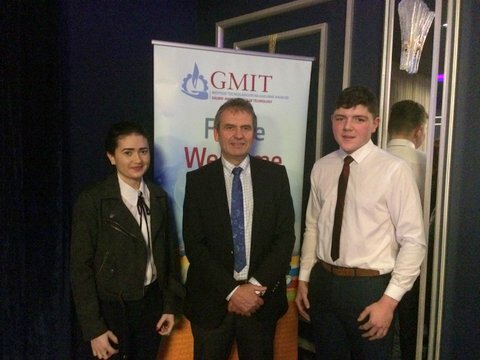 Well done to Pierce Kirrane and Megan Flanagan who were awarded their scholarships at GMIT on Thursday 8th December. Mr. Gay McManus, Principal of Dunmore CS pictured with Megan Flanagan. Megan Flanagan, Mr. 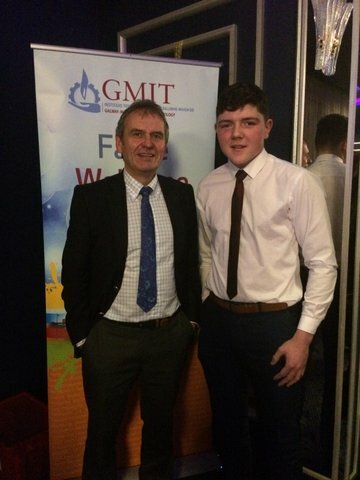 Gay McManus, Principal of Dunmore CS and Pierce Kirrane. 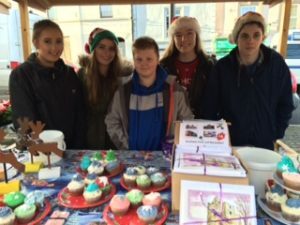 TY students sold iced cup cakes, hand painted Christmas cards and decorations. 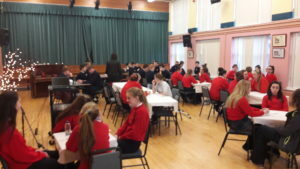 Thanks to Mr O’Gara, Ms Kavanagh, Ms McManus and Joan Burke, Ivory cakes for all their help. A huge thank you to Ms Fallon, Ms Doyle, Ms Clesham who guided us through the project.